Plz tu note, for the unfamiliar, that teh song lead-in tends to come in menny forms of, “I nebber wanted to [be a hairdresser, work in a pet shop, whateber], I wanted to be a lumberjack!” The song itself has been redunned mennymenny thymes. 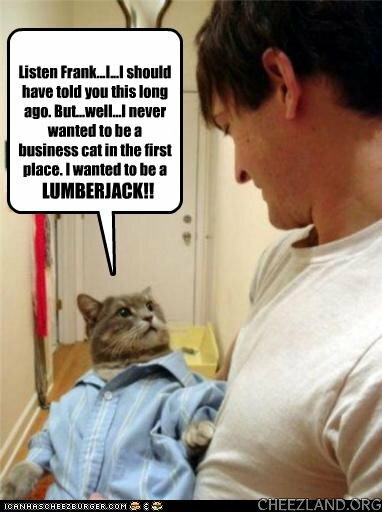 Hims a lumberjakk an hims OK! Ai bin weightin four dix wun.. gathors up pj an jessica and awl 3 brake intwo song. Oh….. u kno da rezt…. Congalumor annipuss an ohai dere puddy_tat. Ohh bf473… wsre am u. Iz lumberjack thyme, kinda like hammer thyme. (Mc hammer wuz wun ov mai star’s favrite purrformers. Hur even hadd parchute pantz). I can has buttured skones for tee? In Cheezland, the time is 04:48.